NZKGI labour co-ordinator Gavin Stagg at Toi Ohomai’s orientation day. Photo: Jamie Troughton/Dscribe Media. New Zealand Kiwifruit Growers Inc has appointed Gavin Stagg as its labour co-ordinator in one of several initiatives to help the industry find the 18,000 workers it needs this season. His appointment is timely as the harvest of early fruit began in the second week of March in Gisborne, Tauranga and Te Puke, while the main pick is on track to begin in mid-April. The co-ordinator’s role, which is to implement initiatives to ensure the industry has the workers it requires for the 2019 season and beyond, has been created with support from the Provincial Growth Fund and the Ministry for Social Development. 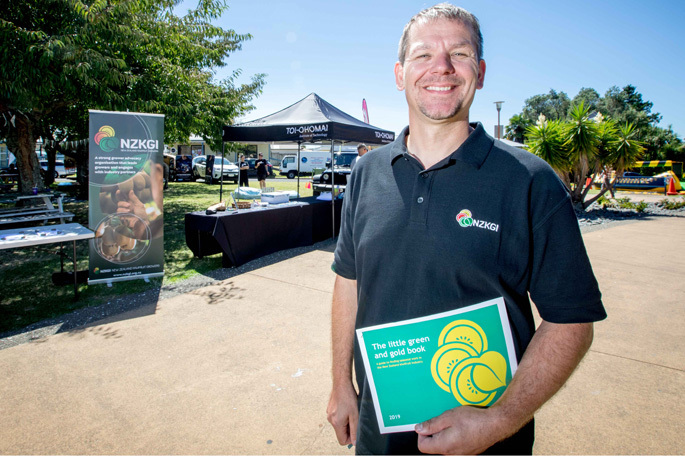 Gavin says he’s looking forward to working with the kiwifruit industry’s partners to help the sector thrive in a period of rapid growth. “NZKGI has a massive challenge to try to ensure we have sufficient workers to get all the fruit off the vines – for this season and all our future ones. Gavin’s been involved in the kiwifruit industry since 2012, working in operations management roles at Mount Pack & Cool Ltd and more recently Birchwood Packhouse Ltd in Tauranga, with a major focus on health and safety. A former NZ Army chef and hospitality industry manager, Gavin’s also worked as a recruitment consultant and employment officer and brings more than 20 years’ experience in managing and interacting with people from many countries and walks of life. In his new role, Gavin is responsible for managing seasonal recruitment initiatives in conjunction with growers, contractors and packhouses to ensure as much as possible is done to meet the sector’s worker requirements. In another pre-season initiative, NZKGI joined Zespri in Wellington in March to discuss current industry topics with a range of Ministers and officials. In particular NZKGI led discussions on the topics of labour and water, which are critical for growers, says Nikki. “The Government is supportive of the proactive positive approach that the kiwifruit industry is taking to attract workers for the coming harvest. The industry’s labour attraction campaign kicked off in the second half of February, targeting local students, Kiwis not in work, retirees and backpackers, to show them what the industry can offer and address any misconceptions about the work. “The aim of the campaign is to tell them about our industry and let them know what’s in it for them. “By using social media, publications, videos, media articles and reaching out to community organisations, NZKGI hopes to attract a large number of workers over a relatively short timeframe from March through June for harvesting fruit,” says Nikki.